With more than 20 years of experience, Canmec is the North American papermaking industry’s Number 1 choice for complete paper machine roll services. From the forming and press sections through to the dryer, calender stack, reel and winder, Canmec provides you with the highest quality custom-made rolls. 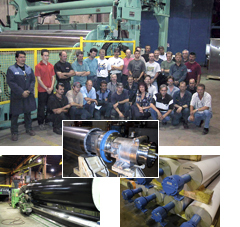 Canmec also offers a complete recovering/refurbishment of existing rolls. New and recovered rolls are dynamically balanced and delivered with a certified NDT report ensuring optimum performance. Our family of urethane covers is industry-renowed for its durability and performance on all types of paper, board, and tissue, no matter the grade of paper, board or tissue being produced. Using the latest in design technology, Canmec keeps your mill competitive, efficient and reliable.